Rain driven by a staunch prairie wind battered us as Willie Rosin guided what he calls his “perfect river boat” down the Minnesota from Waterman’s Landing toward spots known though rarely spoken of publicly. We were after our favorite fish, the sweet-fleshed channel catfish, which despite it’s fine taste is also an excellent fighting fish. We didn’t know if they would be out and about in the 45 degree water, although he had broiled up a family dinner from his limit of the day before — which was a perfect warm and sunny, 70 degree day. Our morning outing offered a distinct contrast. This isn’t news to a southerner who grew up eating catfish (synonymous with channel catfish and not to be confused with distant family members such as flatheads or bullheads), yet to hear this from a child of a tier-state where walleye is considered king was music to the ears. Within moments we each had lines in the water. The wind and rain combined to make it bitterly cold as we hunkered down to await any movement of the line. Moments later my line tightened slightly and I set the hook, and was quickly in battle with a very strong fish. 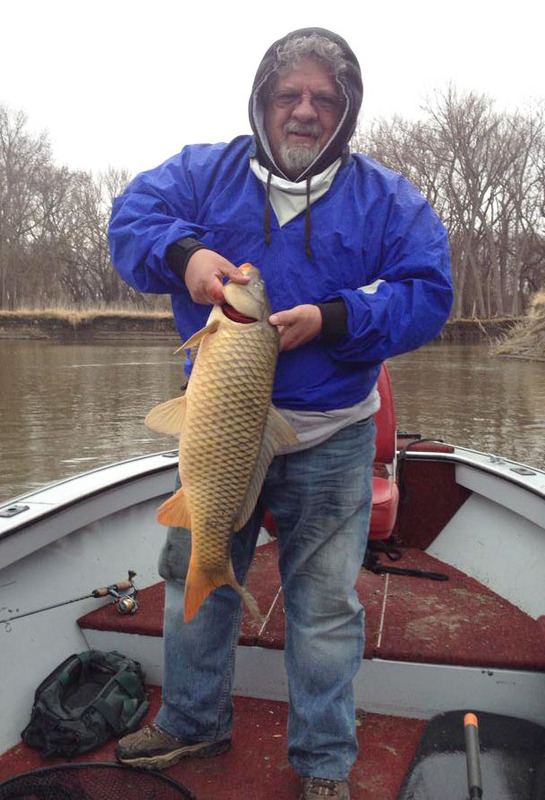 My first river fish of the year was a carp. “A good smoker,” as Willie put it. And, a great battler. It was promptly put into the livewell. Shortly I had another “golden salmon” on the line, which was much heftier than the first. 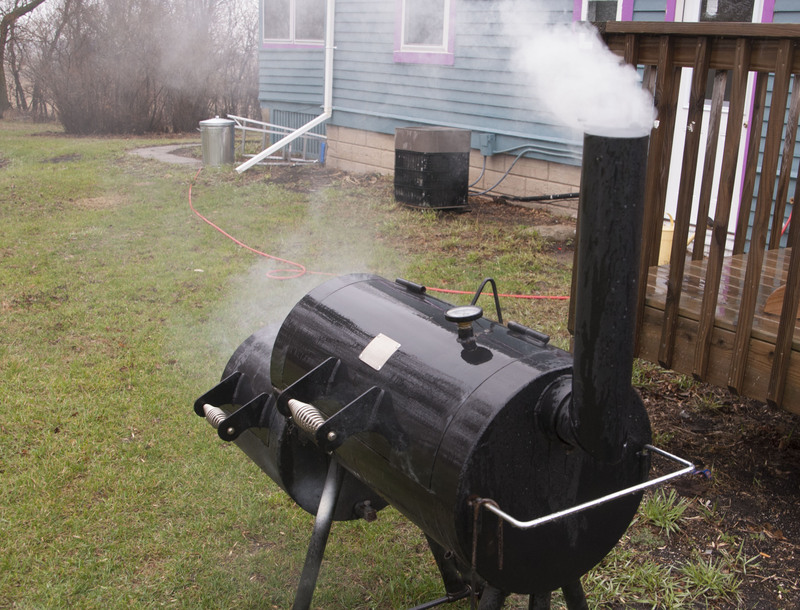 We figured the best smoker was already in the bank so this one was released. Last summer I had caught and smoked one about that size before our trip to the BWCA, which in my mind was just as tasty as expensive, store-bought smoked salmon. With one of the larger carp that we returned to the water. We chatted about people we know who needlessly kill a “rough” fish like that before returning it to the water. A good fighter, though, should be granted a measure of respect. Years ago I hooked onto an amazing fighter in the tailwater of the Granite Falls dam. It was late afternoon, and some men heading into the Legion across the river for “happy hour” stopped to watch. I didn’t know what was on the line, yet hopeful of a large channel cat or flathead. After a good 10 minutes of playing the fish in the fast water I finally brought it to the net. A large carp, probably in the 12 to 15 pound range. When the men saw it was a carp, I saw them waving it off as a joke, laughing as they entered the darkened bar room. It wasn’t a laughing matter to either the carp or myself, and after I disgorged the hook, I slid it back into the water. Then I sat down for a needed rest. Carp will do that to you. Just up river at the Wegdahl bridge a few years later I caught about a ten pound carp on a nymph and five weight fly rod. If that doesn’t give you respect for a fish, nothing will. I was fortunate on two counts. My fly rod didn’t break, and I didn’t have a heart attack. Willie netted a very nice catfish in the three pound range out of the snaggy deadfall, and I hooked another large carp. As we chatted about the similarities of our youths, we hooked a fish or two before eventually gliding downriver to different snags along the way. When we finally bowed to the harsh, cold wind and rain, Willie had a couple of good cats and a smoker carp in the livewell along with two of my five carp. I had also caught a fiddler. He anointed me as the Carp King, a crown I was pleased to wear. 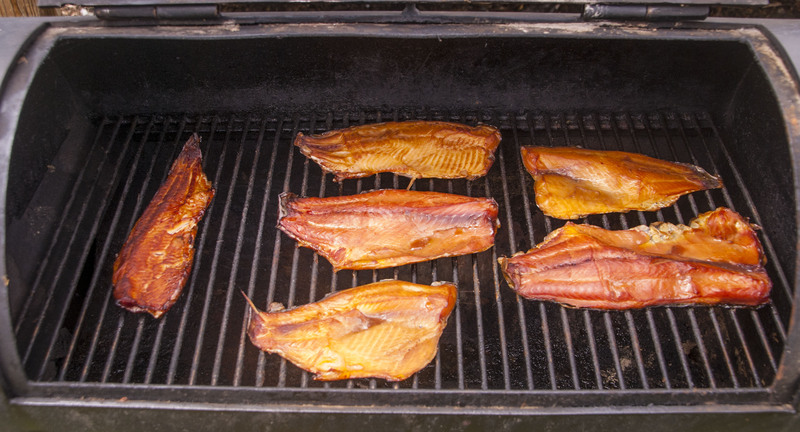 Smoked carp fillets are a treat, for if done correctly they’re really just as tasty smoked as salmon. There are four significant keys to getting that special flavor — bleeding the fish by snipping the gills while they’re still alive, soaking the fillets in a good brine overnight, slow smoking with a sweet wood, and of course, not overcooking it. In my first effort last summer I used a simple brine consisting largely of salt and brown sugar. After an overnight soaking, the fillets were dusted with a Cajun spice before going into the bullet smoker. Although tasty, they were a little too salty for my taste. I thought perhaps the fillets weren’t rinsed thoroughly enough. Smoke from the pecan shells escapes through the chimney of our new, secondhand offset smoker. Online I found a recipe that was both more interesting and less salty. Recipes, of course, are like road maps … guides for an eventual adventure. In two quarts of water went a cup each of brown sugar and soy sauce, a half cup of salt, a liberal dose of fresh ground pepper, teaspoons of onion salt, garlic powder and seasoned salt (I used Tony’s Cajun spice), plus a tablespoon or so of Tabasco. The recipe also called for a cup of apple juice, which we didn’t have and I wasn’t driving an extra 20 miles to buy. After an overnight soaking in the brine, I shook off the excess as I placed the fillets onto my new, second-hand offset smoker. Soaked pecan shells were used for the smoke, with the fillets reaching glazed perfection after about two hours at 180 to 200 degrees. Between our two “stringers,” six fillets went into the smoker, five of which are now in the freezer. The sixth didn’t last too long when company came Saturday night. Featured as the center piece on a cheese plate, we enjoyed the smoked delicacy with chilled glasses of Hinterland Vineyard’s LaCrescent. Ah, yes, the livin’ was easy for the Carp King! This entry was posted in He Said by John G. White. Bookmark the permalink. PS The Minnesota River looks much higher than the time you took us on the canoe trip.